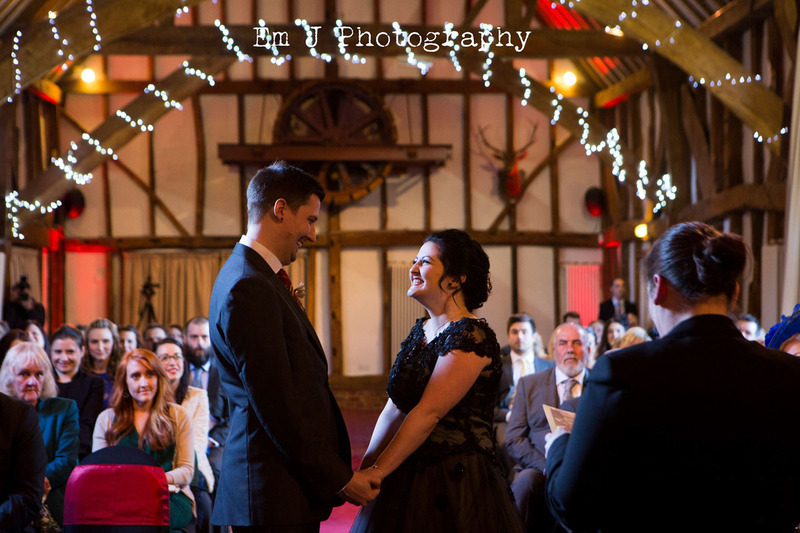 When Sarah and Dan told us they were having a Harry Potter themed wedding we were very excited and wow their wedding day totally exceeded our expectations – every detail was so well thought out. They incorporated the theme with such sophistication and with a lot of fun! The day started filming Sarah getting ready with her bridesmaids and mum. When I knocked on the door Emily from Em J Photography greeted me and we had an ‘I know you’ moment and realised we had met before at an Engage Weddings networking event! Sarah asked her local hairdresser Hair by Amy to style her hair and it looked stunning. Her beautiful wedding makeup was styled by Amanda and we all had such fun getting ready. 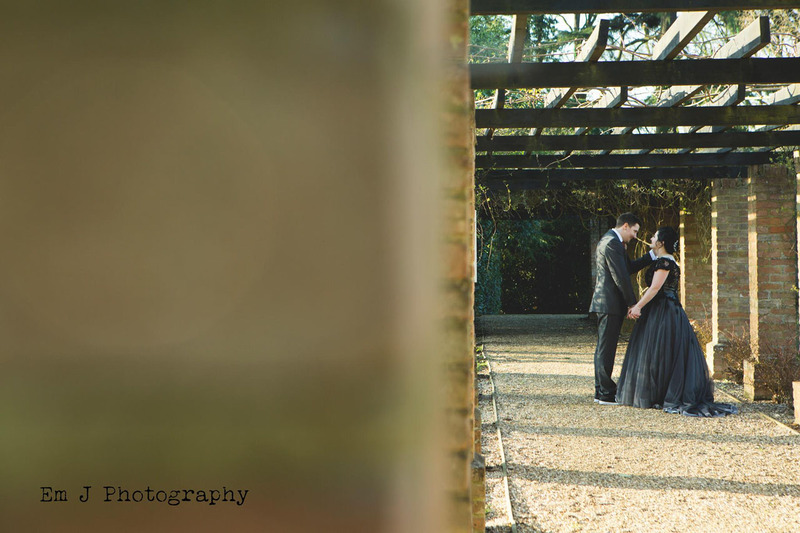 Sarah wore the most exquisite black wedding dress from The Wedding Workshop in Ampthill, Bedfordshire. I love it when brides aren’t afraid to break from tradition. Sarah said she knew a white or ivory dress wouldn’t suit her and felt a black dress would fit with the Harry Potter theme too. Her creativity was inspiring – she handmade her and her bridesmaids’ bouquets from pages of the Harry Potter books herself! I left the girls and drove the short distance up to the barns and met Dan and his groomsmen. Dan showed me the venue set up – largely thanks to 1st Class Events. The multicoloured chair ribbons looked gorgeous and Claire also provided the sweet ladder. The ceremony was amazing with a beautiful white owl carrying the rings, in the spirit of Hedwig. This was a surprise for all of their guests and it was brilliant. Something I’ll never forget! The Harry Potter decor was fabulous too with wands on the tables and place names carved in the Harry Potter font. Their cake was absolutely stunning made by the very talented Cakes of Good Taste in Bushey Heath. 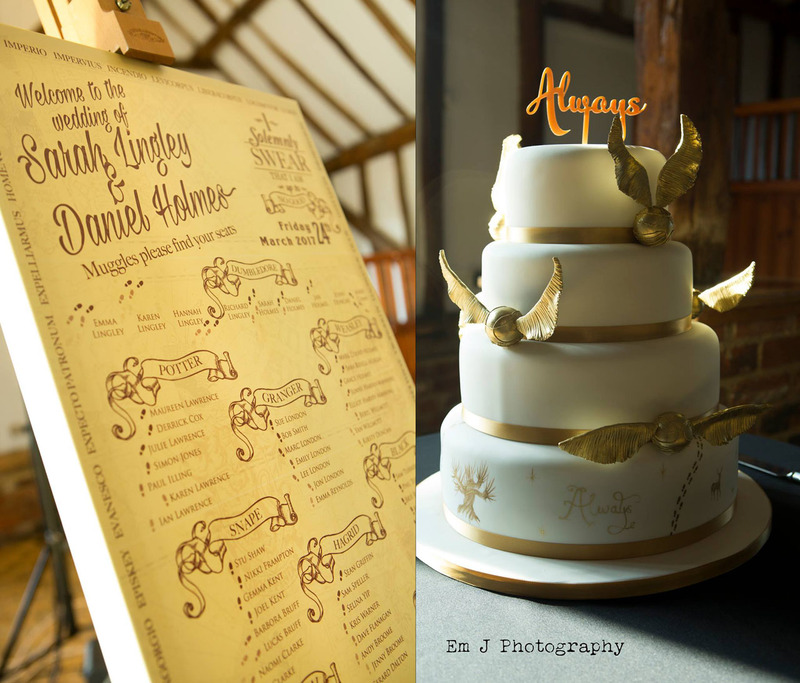 Decorated with the famous words of Professor Snape ‘Always’ and with snitches across the tiers – incredible! We loved the table name balloons with the main characters from Harry Potter printed on them supplied by Balloon Boutique in Stevenage. The attention to detail was so well thought out. We asked Sarah what her favourite moments of the videos are. These moments are what makes having a wedding film so worth it. Video really brings the day back to life with memories for you to treasure forever. I have since been lucky enough to film Sarah’s sister Hannah’s wedding at Bury Court Barn too – thank you so much for recommending me Sarah! Having a Harry Potter themed wedding and looking for a videographer? Contact me below, I’d love to capture your special day.